Thinking of something quick to make for your next get-together or party? 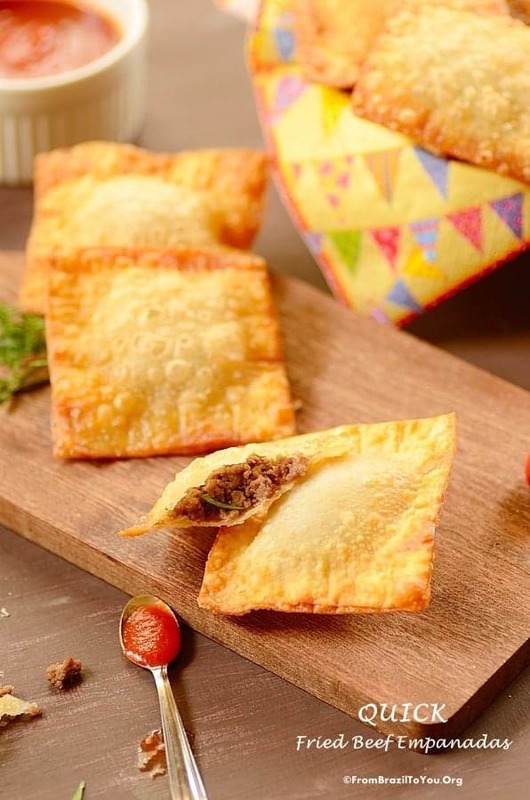 These fried beef empanadas (pastel de carne) will both save you time and make your guests quite happy. 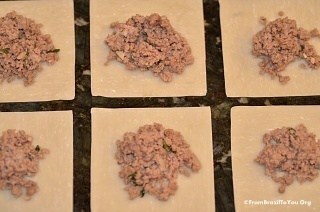 The secret for preparing them quickly is to use wonton wraps instead of making the dough from scratch. 😉 Basically, the only difference between these and the traditional fried beef empanadas is the use of the prepared wonton wraps. Of note, among all the various types of fillings for the empanadas, ground beef is the most popular. If you would like to find out why, make a batch and give them a try! 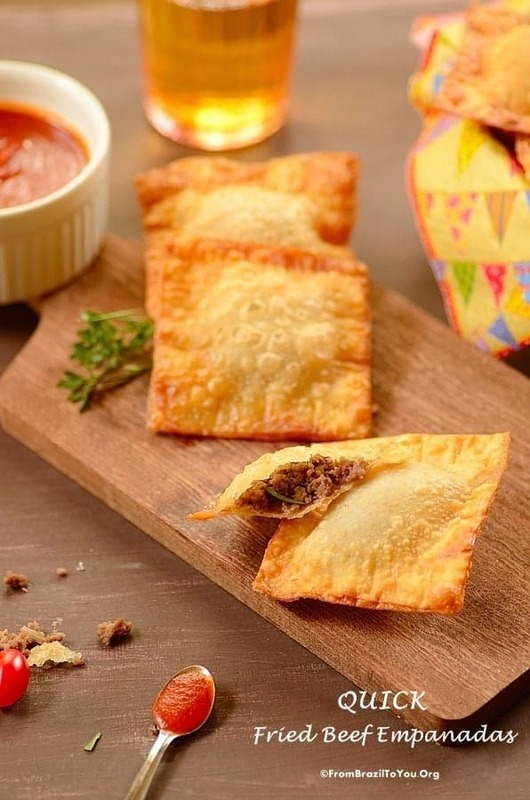 These small fried beef empanadas are quick and delicious! They can be served as an appetizer or an afternoon snack. In a medium non-stick skillet, heat the oil and sweat the onion over medium heat for about 2 minutes, stirring occasionally. Add the garlic and let cook for about 1 minute, stirring occasionaly (NOTE: The purpose is to cook the onion and garlic, NOT to brown them). Increase heat to medium-high and brown the ground beef, stirring every now and then. Stir in both the salt and pepper, and then the tomato paste. Stir in the vinegar or lime juice. 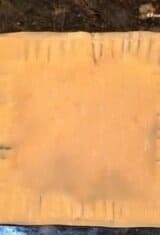 Let ground beef cook, uncovered, for about 5-7 minutes or until cooked throughout, stirring occasionally. Stir in the olives (optional) and the chopped cilantro or parsley. Let cool a bit before filling the wonton wraps. Place the wonton wraps on preparation surface. Fill each with 1/2 to 1 Tablespoon of the cooked ground beef mixture and brush the egg white around the edges. I love the wonton skin shortcut! 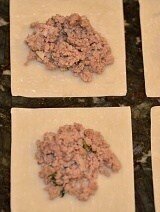 And I can see why ground beef is such a popular filling as your empanadas look so darned tempting! I want to snack on this one, perhaps with beer as well. Love this. Beer is great option as well. I love mine with guaraná soda. What a wonderful idea to use wonton wrappers. These look just wonderful. I could easily make a meal on these. It is a great shortcut for sure. Hi, Dedy! It seems that several cultures have their own version of this fried pastry. Fillings and shape are what differ one from the other. I love your idea to use wonton wrappers for these little empanadas! Such a wonderful treat, Denise! Thanks, Shashi! Wonton wraps are a blessing in disguise. It is the best shortcut ever…. I use wonton wrappers for quite a few different snacks. 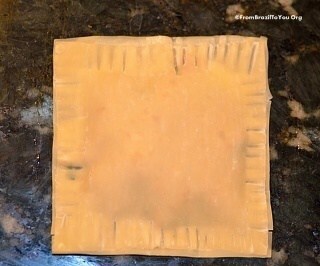 Making empanadas with them is such a clever idea. I can’t wait to give these delicious empanadas a try! Wonton wraps are also great for making ravioli without having to spend a long time in the kitchen. This is what I intend to make next time. I love those wonton wrappers — you can use them for so many different things. Never would have tought to use them in empanadas, though. Love the idea, and the recipe. Thanks! Wonton wraps are really versatile. Hahaha! I thought you made massa para pastel and realized that you used wonton wraps…love the twist! Thanks, Juliana! Wonton wraps made my live much easier. Hehe! Likewise. What a delicious way to start our day (it’s morning here), reading your yummy post:) Of we go, to buy some minced meat! Panos and Mirella: Thank you! Phyllo dough can also be used to make these. It is a great shortcut so one doesn’t have to make the dough from scratch. I hope you make yours with phyllo dough and enjoy these. What is it about that half-moon shape that’s so great? 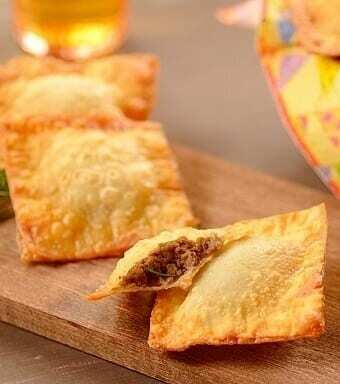 I love the idea of beef-stuffed wanton empanadas~!!! Oh my goodness! These tempting empanadas would keep my family very happy, but only if I made a double batch! Adore the quick prep paired with so much great flavor. Deb: Thanks a lot! The wonton wraps are a great sub for dough made from scratch. I have been so busy lately that making a dough from scratch would be a hassle. Great snack for my tea time. Hi, Sara! Thanks and welcome to FBTY. A smack to munch on! 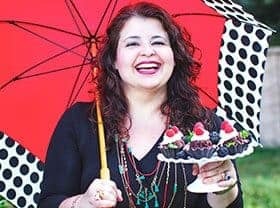 We make this in a very similar way having a spicy mix as a filling as well as coconut and sugar mixture too..
How interesting, Deepti! I would love to try your coconut-sugar filled empanadas. My mother used to make fried empanada but filled with what we call fresh cheese, but filled with meat is a wonderful idea. Thanks, Nydia! In Brazil, there are many different fillings for empanadas but ground beef is the most popular filling.